Yes, I'm serious. I know all of you Californians are spilling your iced coffee right now, but the fact of the matter is that this 4,500-square-foot fully restored historic home (built in 1922) in Little Rock's beautiful Quapaw Quarter is on the market for less than half a million dollars. And no, there is no catch. It's not in a bad neighborhood. (In fact, it's in the city's best neighborhood. The Governor's Mansion is just five or six blocks away.) It's not in bad condition. It's just in Little Rock, AR, where real estate sells for $100/square foot. You heard me. It took me a few days to pick my jaw up after learning this, but clearly this is the kind of reverse sticker shock (too cheap to be believed!) that I needed. 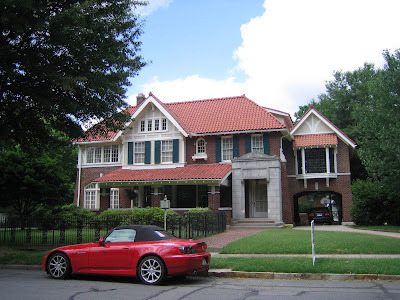 In Little Rock, I could buy a massive, architecturally significant historic home that is part of walking tours for $450K. In my Los Angeles neighborhood, I wouldn't be able to buy a two-bedroom, two-bathroom apartment for that price. I'm too dumbfounded to say anything profound or witty about this staggering comparison just yet. All I know is that the wheels are turning at warp speed, my friends.